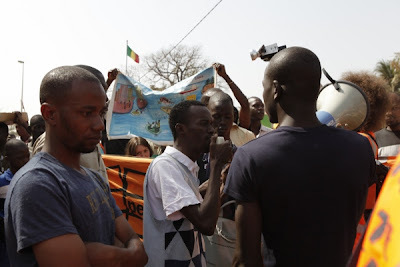 Reclaim the Seas: Afrique-europe-interact - Aktion in Bamako in front of french Embassy. Afrique-europe-interact - Aktion in Bamako in front of french Embassy. 26.1.2011 In front of the french embassy in Bamako 200 persons participated in a protest rally against deportations from France. The protesters' aim was to draw attention to the fact that last week there were 6 Sans Papiers deported by the French government. On their way to the embassy, the participants chanted „Á bàs les frontierés, a bàs les frontierés!“ (down with all borders). A letter of protest was delivered to the embassador. Soon after, the malian police started to attack the protesters. The situation escalated when tear gas was fired into the peaceful protest. About 5 participants were lightly injured.